Emergencies of any kind are never welcome. But they can be especially stressful when they involve your mouth or your teeth. 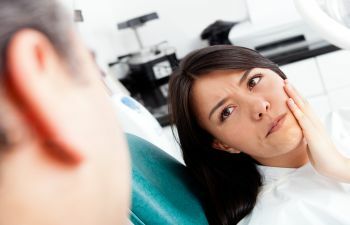 While dental emergencies are difficult to prevent entirely, there are some ways you can prepare for the event if it were to occur – even if that means just gaining knowledge about what requires an urgent visit to the dentist and what can wait. If you are concerned about a sudden tooth trauma or unexpected dental pain, it is always best to call your dentist. Leaving a dental emergency untreated can lead to worsening symptoms and more costly treatments. Teeth can get chipped, broken or even come out during an injury or trauma. Whether it was a bad fall or a sports accident, emergency dentistry could mean the difference between saving or losing a permanent tooth. Since time is of the essence when it comes to addressing a dental injury, you need to know some dental first aid until you can see your emergency dentist. See A Dentist Today or Within the Week? It is important to know that an avulsed or knocked-out tooth needs to be treated by a dentist immediately. In fact, getting to your dentist within an hour is your best chance of saving the tooth and having it re-implanted. If possible, hold the tooth back in its socket on your way to the dentist. The next option is to place the tooth in a cup of milk or water to keep it moisturized. Never handle the tooth by the root, and wash it gently if it gets dirty. Other dental emergencies, such as a lost crown and fillings should also be seen promptly, but they may not require urgent treatment. Toothpaste or adhesive cream can be used to hold the restoration in place until an appointment is available with your dentist. If you have an injury that won’t stop bleeding and need stitches, seek professional care quickly. Be careful about going to an ER for dental emergencies, as they are not properly equipped to treat tooth damage. You may also need cosmetic treatment to ensure your smile appearance doesn’t suffer due to your dental injury. At Gold Hill Dentistry, we are here to handle your urgent dental injuries. Call our office today if you or a family member has suffered unexpected tooth trauma. We offer a full menu of restorative and cosmetic dental services to ensure all types of dental emergencies are addressed with the highest level of expertise.